Recent technology advancements provide worldwide information exchange that has been invaluable for the scientific community, particularly for issues surrounding global climate change. Many online learning spaces have developed which are often repositories of information rather than a space of knowledge construction. Classroom dialogue is shown to be an important component for effective learning, therefore it should be developed online as well. This article explores how social media can support dialogue in e-learning. Interactions were studied in two online courses about regional climate modeling. The first used traditional forums and the other promoted a Facebook group for online interactions. Qualitative results indicate that the Facebook group showed improvement because elements of dialogue began to emerge, including open-ended questions and episodes of peer discussion. Quantitative findings suggest the Facebook interactions were perceived as more informal and participants posted, responded, and interacted with their peers more significantly than traditional forums. One of the biggest challenges facing society is our ability to mitigate and adapt to a changing climate. This creates an important challenge in education because it is imperative that knowledge, skills, and trainings about the earth system are made available not only to scientists, decision makers, and leaders of developing countries but everyone else as well. In a paper submitted to COP17, Mesquita, Veldore, Yarker, and Lamadrid (2011) highlight the challenges and potential solutions to make professional development accessible to weather and climate model users in developing countries. For many, limited funds and available resources make it difficult to adequately assess the challenges their region of the world faces in light of a changing earth system. Traveling to facilities is extremely costly and limits the time participants can interact with the instructor (most sessions lasting only a week). Additionally, there can be political constraints, including restrictions on who can travel to what country as well as the number of participants allowed per country. Finally, with short, in-person professional developments (i.e., instructors and students travel to the same physical space), follow up with the instructor as the participants attempt to apply their new knowledge to their region can be lost completely. Prior research suggests that participants who are able to follow up with their instructor regularly after a professional development are better able to adequately apply the new information to their own setting (Penuel et al., 2009). Therefore, knowledge and resources need to be readily available whenever possible. An online course that can effectively teach professional scientists how to set up and run weather and/or climate models can provide a cost-effective solution to many of these issues, because each scientist can take the course on their own schedule from anywhere in the world. However, utilizing an online environment to construct knowledge comes with its challenges. In particular, how best practice educational theory can be applied to maximize learning, rather than to be a static online repository of information. 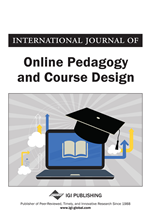 Some strides have been made to address this issue (e.g., Walton, Yarker, Mesquita, & Otto, 2016), but the role peer-to-peer dialogue plays in online learning has yet to be extensively studied. While forums are commonly used to facilitate discussion in online spaces, we found that they were generally underutilized, thus peer-to-peer discussion was not occurring. Many of our participants would introduce themselves on a forum post (requested as part of the first assignment), but after that rarely posted again, seeming to prefer emailing the instructor directly. We hypothesize that forums may be problematic because 1) they are not an integral part of student’s day-to-day life (like the way email is) so they are not regularly checked, and 2) may be intimidating because they may be perceived as a formal tool within a formal learning setting. Therefore, it was necessary to explore alternative tools for online discussion. There is emerging research that suggests that social media can be an effective learning tool. Kotecha (2017a) states that “the contribution of Facebook to promoting inclusive education, student interaction, and collaborative learning [is] highly significant.” We believe that social media (as part of many people’s everyday life) maybe checked more frequently and may be perceived to be a less formal (though still “public”) space for discussing course content over forums.